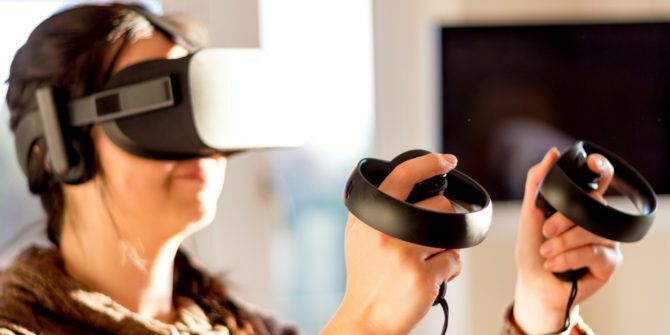 Despite literally kickstarting the entire virtual reality industry, the Oculus Rift has still felt incomplete since the launch of their consumer headset in March 2016. Without motion controls, it’s been accused of being a glorified 3D monitor. That’s all changed now that the Touch controllers have been released, but the journey to achieving the full VR experience with Oculus is not a smooth one. Touch retails for $200, bringing the cost of the Rift headset and Touch controls inline with that of the competing HTC Vive HTC Vive Review: Virtual Reality is Finally a Thing HTC Vive Review: Virtual Reality is Finally a Thing The HTC Vive for Steam VR redefines gaming, and more besides. It's the closest thing to a Holodeck I've ever seen. And it's absolutely incredible. Read More . However, this doesn’t mean the systems are entirely at parity: you may need to budget at least another $150 for an extra sensor and extension cables if you want a full “room scale” VR experience. Let’s get the bad bits out of the way first, before we talk about the incredible controllers themselves. Reviewers that criticised the HTC Vive for having a complicated setup should be hurling insults at Oculus for this nonsense. In the Touch box you’ll find one additional camera, which Oculus recommends placing on either corner of your desk, about 2m apart. This gives you the standard forward-facing tracking. My wife jumped into the Touch tutorial without any prior knowledge of the Touch system, and within seconds, she had turned completely around to face the other way, losing tracking on the controllers. It’s just not natural to force yourself to look only forwards within VR. We quickly added the third sensor and ran through the experimental setup. It turns out that for something designed to be “universal” however, USB is actually quite fickle. I should note that the default out of the box setup – with just two cameras – seems to be more reliable, though even then some users are reporting severe tracking degradation after a while, with controllers literally spinning out of control. However, if you want to do something crazy like turn around in your games, or take more than a step in either direction, then you’ll start to run into problems and need to purchase a third (and maybe even fourth) camera. It’s this experimental 360° and room scale tracking that’s causing the most frustration. Oculus recommends placing the third sensor on a USB2 port to avoid overcrowding the USB3 bus, and they include an active USB2 monoprice extender in the extra sensor package. But some developers have found all using USB3 reduces tracking issues, and that’s now how I’ve placed mine. Motherboards have different USB controller chipsets, and not all of them are compatible. If you don’t have compatible USB3 ports, or you just don’t have enough, or they’re somehow bandwidth limited because they’re shared by a PCI slot, you’ll want to buy the recommended Inateck PCI-E USB3 4 or 5 port expansion card based on the Fresco Logic chipset, as I did. The current advice seems to be install the latest driver from the Fresco Logic site, though some report greater success with the default Windows drivers. Run a registry hack found on the r/Oculus subreddit and disable power management on all the USB ports. Power requirements seem to another problem; it’s recommended you only use two of those USB3 ports on your USB3 expansion card, or purchase a powered USB3 hub (Anker 7-port is the current recommendation). You’ll need at least one extension cable if you want to use USB3 for all cameras, more if you want to mount them high and in the corner, rather than the default corner of the desk setup. Check the r/Oculus list of tested cables first, because not all work. Audio may cut out after 5 minutes. Try lowering the bitrate from 48kHz to 44kHz from the Windows playback device settings. Ultimately this was indicative of other USB issues for me. Shut your curtains and cover or remove all reflective surfaces. Keep swapping around between USB ports while performing a blood sacrifice and reciting the Oculus Oath of Allegiance. It took me about a week of fiddling around before I had a working setup that didn’t crash every 5 minutes, or lose the audio randomly. I still get “headset not detected” errors every day, requiring me to unplug and reseat the HDMI cable. It’s very frustrating, but at this point, I consider myself one of the lucky few that has reasonably good tracking – and the hiccups I do have aren’t game breaking. You might not have the same experience, and it might work out of the box for you – if so, congratulations. The number of Reddit threads requesting help with setting up sensors should give you some idea of the absolute frustration many are facing. There’s a good reason Oculus labelled their room scale tracking as “experimental” – it’s clear that they never intended for their system to be used in the context of room scale, that it was instead considered late in the process as a reaction to their competition. I wouldn’t be surprised if Oculus has realised the limitations of their Constellation system and completely dropped it for next headset, putting their efforts into an inside-out tracking solution instead (whereby a camera or device on the headset itself “looks” at the world around it to detect obstacles and position). The Constellation system just isn’t up to the task, but it’s the best we have for the Oculus Rift at the moment – and hey, it might work for you. Despite all this, does room scale work? Sort of, mostly – with extension cables, another tracking sensor or two, and assuming you overcome the setup issues I experienced. The Constellation tracking is inferior to the Vive’s Lighthouse system – that’s now undeniably obvious. The tracking volume and accuracy is just not as good. Enthusiasts with expansive VR play spaces will probably want to stick with Vive. Touch Controllers: How Do They Work? The thumb rest isn’t strictly a button, but it does sense whether or not your thumb is there thanks to a capacitive sensor. This is also true of the two game buttons, the trigger and the grip button. By combining all of this data, the controllers can report a number of gestures being made, such as pointing (thumb on the rest, grip pushed, trigger released); hand open (all buttons released and thumb off rest, controller still gripped by ring and little finger, obviously, or you’d drop the thing), or thumbs up (grid and trigger being pressed, thumb up), as well as smaller interactions such as exactly which button your thumb is resting on. However, it’s a bit of learning curve to get used to these strict gesture controls, and on occasion it all feels a bit … forced, like they’re using gestures for the sake of it rather than making the interaction more natural or immersive. Some games require you to depress the grip button constantly to keep objects held in the hand, dropping them if you let go. This just feels tedious when you’re already gripping the controller itself – a simple toggle for dropping the gun would suffice, and would avoid straining after extended use. This varies by game, so Rec Room (originally a Vive title) lets you pick up objects with the grip button, not have to keep it held down, then drop them with the B-button. It’s not clear how many games will actually want to take advantage of these gestures, but you can be certain of some Facebook social VR tie-ins at some point, which will inevitably involve giving your friends a VR-poke or thumbs up. Only games using the official Oculus SDK will get access to this, so many of the popular Steam games only have basic button support. Hopefully the new Open VR initiatives will improve the situation, but right now only a handful of games support the new gesture system. Anyone that has tried to interact using the Vive’s silly tracking pad however will immediately appreciate the analog sticks. Obviously, they’re not a technological leap – they’re just a much better choice for a controller if you still need some kind of analog pointing device. As for more direct comparisons with the Vive controllers, my best point of reference is Rec Room, in which I’ve racked up over 40 hours in paintball mode and maxed out the level system. This is purely subjective, but I prefer holding something more substantial. The Vive controllers are chunkier – they feel more like holding a gun – and I can hold them as loosely or tightly as I want. Touch requires your fingers and hands to be in one particular position, and it’s not really negotiable: you will hold the controller in the manner Oculus deems appropriate. They’re less substantial – smaller than the Vive wands – which doesn’t really seem to match the feeling of holding guns, but obviously matches better the feeling of simple hand presence. Oculus should also be praised for making each controller run off a single AA-battery. All portable electronics suffer from battery degradation over time, so being able to replace these with affordable, rechargeable, standardised batteries is laudable. It also keeps you playing if they run out mid-game: though the Vive batteries are higher capacity, if you need to charge them they can’t be used for another hour or so. Every since playing with Tilt Brush, I’ve wanted an actual 3D modelling app. With Oculus Medium, I now have that, and it’s absolutely glorious. It’s well suited to the Touch controllers, and incredibly intuitive. Unlike Tilt Brush, even if you have zero experience with modelling or sculpting, you should be able to model something cool. Even better: the models can be exported, then 3D printed. It’s absolutely mind blowing. Arizona Sunshine is one of the bigger launch titles (though not exclusive) – a zombie shooter with teleportation movement. It’s fun enough, though I found the scaling to be off. A co-op mode makes this a winning title for many, and you can play alongside Vive owners who purchased on Steam. SuperHot – or at least a specially produced VR version of it – is probably the hottest Oculus Touch exclusive content at the moment. The game has a unique “time only moves when you do” mechanism, allowing you to perform incredible Matrix-like bullet dodging and weapon snatching as you battle your way through scripted scenes. Then there’s The Unspoken, and Dead and Buried. The former is a curious multiplayer magical battle; the latter a Western themed arcade shooter. Neither was particularly compelling unfortunately, and I quickly went back to RecRoom. The official MineCraft VR (based on the Windows 10 and available on the Oculus Store) added Touch support, but you should leave that well alone. Instead, check out the ViveCraft mod for the Java version, which is embarrassingly superior in every possible way and also compatible with Touch. Of course, Oculus users also have full access to the vast library of Steam titles (the opposite is also somewhat true, thanks to the incredible developer behind ReVive). Some offer full support for the Oculus SDK, some offer only OpenVR compatibility, and very few don’t support the headset and controllers at all (Google Earth VR, for instance). Oculus now has a complete VR experience to offer, and if you already have an Oculus Rift headset, the Touch controllers are an essential purchase. You might have convinced yourself that room scale is a fad, and we could argue about it all day – but you’re wrong, and it’s time for you to join the party. However, along with moving around more, the limitations of the Constellation tracking system become clear, and because of that I’d recommend splashing a little more on at least a third sensor. You may also need to buy extension cables, a USB3 expansion card, some lighting stands or tension rods and associated mounting points. Budget another $150-$200 at least for the sensor, cabling and mounting points. For those with larger play spaces, I still recommend a Vive for better room coverage, less cabling, easier setup, and lower overall cost once additional purchases are factored in. If you already have a HTC Vive, there’s certainly no reason to jump ship to Oculus. The Touch controllers are an amazing bit of tech – well designed, sleek, comfortable controllers – but the gestures they bring to the table aren’t that more useful than the Vive wands you’ve had for months, and you’re more likely to notice the limited tracking of the Oculus Constellation system if you’ve experienced the Vive. Explore more about: Game Controller, MakeUseOf Giveaway, Oculus Rift, Virtual Reality. Can't find a code! Gadget looks cool, would love to have one! Where is the competition widget? to type the code in? The competition entry form is right under the video. If you can't see it, you may be running Adblock , NoScript, Ghostery; please remove those or any other plugins which block loading of third party scripts and advertising. The technology gear is totally amazing.The review was great easy to understand and how it all works is totally awesome. What fun you could have. Technology taking another step up. I added a 3rd tracking camera with zero issues and my touch controllers have been flawless since launch day. I have a relatively small play space and the setup worked first time. My front cameras are about 9ft apart and the 3rd camera is 8 ft behind, in the back right corner. My cameras are also elevated looking down. The front left camera is attached with a 10m active usb extender, I usually have re-plug it every boot up to activate it. It's hardless flawless if you have to plug it in again every time. I'm glad you've a good setup, but it's clear you're in the minority. This shouldn't be a lottery! A perfect gaming gadget. The way you reviewed is really well. Just looking for the code, unable to find out. I agree. I can't find the code either. He says it at the end. Thanks, I was used to finding it on the screen.